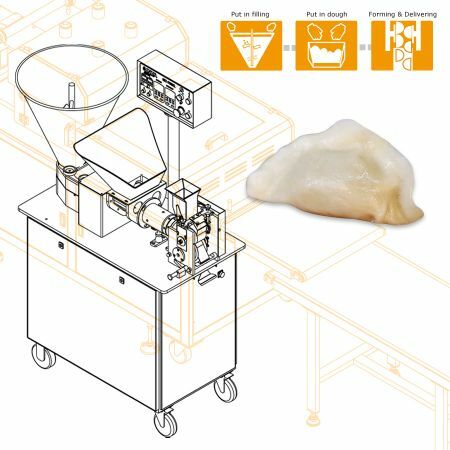 Dumpling Machine and Equipment - ANKO High Efficiency Dumpling Production Equipment Design | ANKO FOOD MACHINE CO., LTD.
ANKO's Gyoza machine model HLT-960 was first invented in 1988, enabled mass production instead of manual productions. However, HLT-960 was only suitable for producing Chinese dumplings, as ANKO approaches the international market, we have found that the machine could not satisfy similar products in the Western countries, such as pierogi, tortellini, ravioli or empanadas. Therefore, ANKO's R&D team invented the HLT-700 Series, which are able to work with different dough recipes and production is doubled in speed, not to mention the different product lines it may create by changing dumpling molds. Nowadays, in order to meet the array of market demands, ANKO keeps coming up with solutions for our customers, various accessories and services are created to enable mechanical productions of delicate products that was only able to be hand-made, such as soup dumplings, hagao (Cantonese shrimp dumplings, calzone, Jamaica patty and etc., which helps our clients increase product lines with less coast. The new machines are suitable for factories or even independent restaurants. “Dumpling” is a rather generic word in English; it may refer to foods that consist any types of dough wraps or batters that are stuffed with fillings, or various types of starchy dough nibs or lumps in a dish. The typical dumpling fillings and condiments may vary according to each country or region local traditions, accessible ingredients and taste preferences. In East Asian countries, pork and vegetables are most commonly used to make dumplings. When reaching to Central Asia and Middle East, the dumplings are made of beef and lamb. Occasionally, fish dumplings are dished up and win favor with many gourmets. Wrapper-and-filling dumpling could be simple or haute cuisine with limitless flavors developed from different recipes of dough and filling, cooking techniques, and creative combinations. The other perk about dumplings is that they can be frozen and easily stored, which adds a lot of convenience to the delightful cuisine. The machines listed below are designed for making Dumpling. Please feel free to contact us via the form below. We will happy to answer any questions you may have regarding our products, services, and turnkey projects. 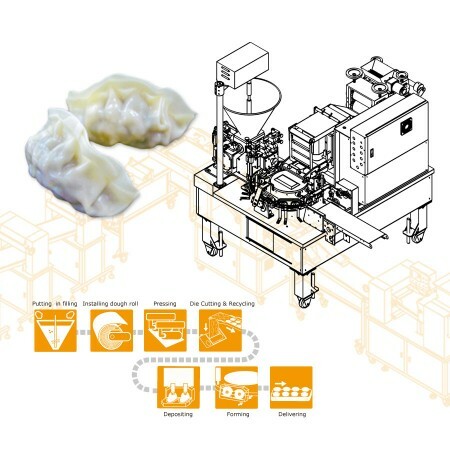 The automatic dough belt making machine can produce noodles, wonton wrapper, shumai wrapper, dumpling wrapper, etc. After putting dough into the hopper, the machine designed to knead, press, and roll like actual hands to produce a roll of elastic dough belt automatically. The dough belt with a minimum thickness of 4 mm is leveled evenly with consistent quality. With ABS-220, it enables quick dough belt making and a large increase in throughput. Automatic Dual Line Imitation Hand Made Dumpling Machine is one of ANKO best-selling machines. It automatically produces stuffed products such as dumpling, fried dumpling, steamed dumpling, gyoza, etc. According to the individual needs, forming molds for different product sizes and appearances can be customized. ANKO's machine is made of food grade materials, patented, and certified by CE. We insist to supply clients with the best quality and service.